Regardless of whether you’re deep in the Outback or on a weekend off road foray, a reliable communication system is paramount. GME manufactures a vast range of quality radio equipment and accessories to ensure you’re always in contact no matter where you are. Combining tough, durable electrics with smart, easy-customisation technology, GME is the leader in radios engineered to survive harsh off road conditions. Fitted to your vehicle’s dash or console with minimum fuss, each radio comes with a host of features to suit your individual needs, from signal strength metres and adjustable squelch to programmable scan functions and energy-saving quiet modes. 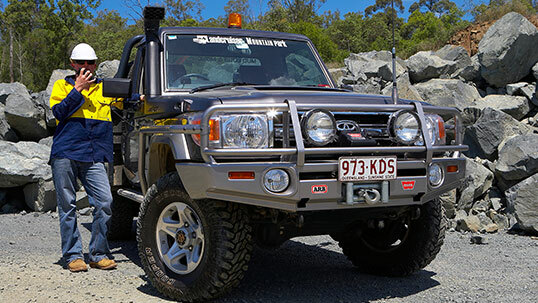 UHF handhelds combine the benefits of reliable communication with the freedom to leave your 4WD behind. GME’s handhelds each come with a desktop charger and AC adaptor or rechargeable batteries, and a number of additional accessories are also available. Regardless of how sensitive your receiver is, without a quality antenna your UHF radio’s ability to receive and broadcast signals will be severely limited. Selecting the correct antenna is dependent on a number of variables, and ARB can assist you with choosing the right model for your requirements.